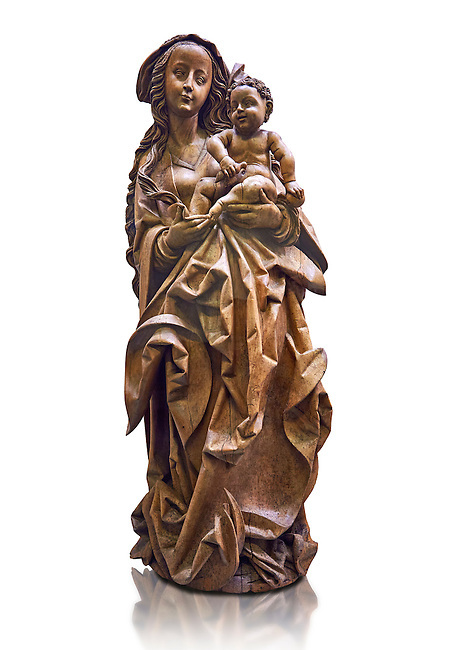 Wooden Gothic sculpture of the Virgin and Child attributeed to Martin Hoffman from the city of Basle, 1507, Switzerland. From the Commandry of Isenheim, Haut Rhin. This sculpture is probably the "big and ancient wooden statue of the Virgin” cited in 1793 in the inventory of the property of the Commandry of Isenheim. The vervatious deep folds in the Virgins dress, the laughing child Jesus and the style of Mary were repeatedly imitated in Basel at the beginning of the sixteenth century. This masterpiece of the German late Gothic sculpture was executed in a Basel workshop and can be attributed to Martin Hoffman. Expressive and enigmatic, the style of this masterpiece is the heir of the sculpture schools of Stragbourg and Veit Stoss Franconian art. Inv RF 1833 The Louvre Museum, Paris.